Today I have teamed up with the beautiful Corinne from Pink Avenue! How cute is she? Today we wanted to show you two different ways to wear floral! It is a huge trend this season and it is one of my favorites! I love how Corinne mixed floral with polka dots! 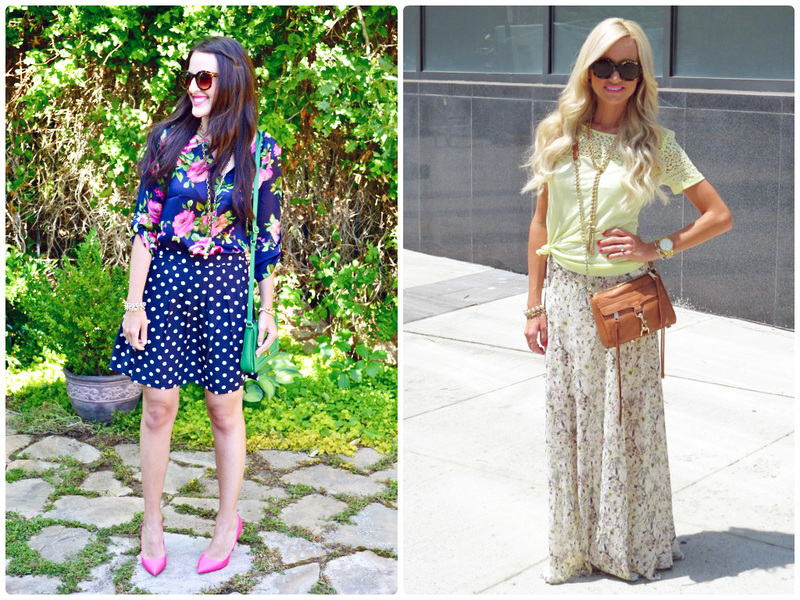 Floral is fun to use as a neutral and add another pattern or if that is to much for you it works perfectly on its own! Make sure you check out Corinne's blog and follow along! I am sure you will love it as much as I do! She has amazing style and is such an inspiration! Love this floral look! That skirt is gorgeous on you! Love your blog! Hey !! Just wondering what brand your watch is? Such a gorgeous outfit!! Loving the skirt.. This is so pretty! Love the casual tee knotted with this skirt. Great summer look. I love your romantic floral skirt Jade, you look gorgeous!